Ein weiteres, aktuelles Standardwerk zum Thema! How to Use the Book. PART I METHODS FOR DIAGNOSING FISH DISEASES. 2.) Types of Culture Systems. Equipping a Fish Disease Diagnostic Facility. Sampling for Water Molds and Fungi. Zoonotic Diseases and Other Human Pathogens. 5.) Guidelines for Interpreting Clinical Findings. Environment, Stress, and Fish Disease. How to Use Part II, the Problem List. Clinical Decision Making: Have the Major Problems Been Identified? 7. PROBLEMS 1 through 10: Diagnoses made with commercially available water-quality test kits or equipment that should be present in the clinician's clinic. 7. Too low (too acidic) pH. 8. Too high (too alkaline) pH. 8. 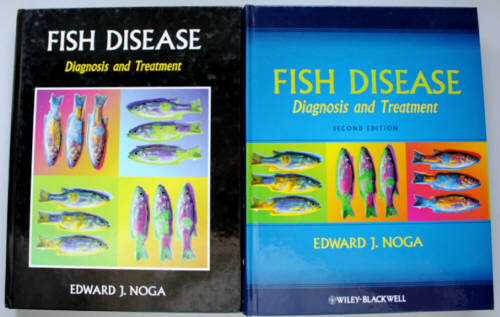 PROBLEMS 11 through 43: Diagnoses made by either gross external examination of fish, wet mounts of skin/gills, or histopathology of skin/gills. 19. Protozoan ectoparasites: general features. 21. Marine white spot disease. 32. Sessile, solitary, ectocommensal ciliate infestation. 33. Sessile, colonial, ectocommensal ciliate infestation. 34. Typical water mold infection. 38. Bacterial cold water disease. 42. 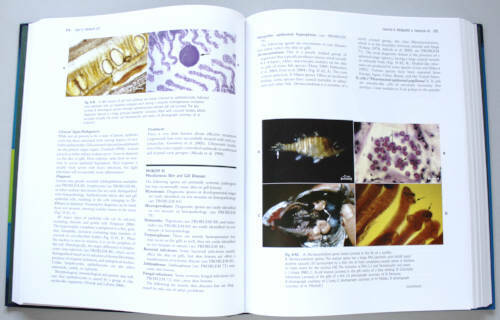 Miscellaneous skin and gill diseases. 9. PROBLEM 44: Diagnoses made by examination of a gill clip or a blood smear. 10. PROBLEMS 45 through 57: Diagnoses made by bacterial culture of the kidney or affected organs. 45. Bacterial dermatopathies/systemic bacterial infections: general features. 48. Enteric septicemia of catfish. 57. Miscellaneous systemic bacterial infections. 11. PROBLEMS 58 through 76: Diagnoses made by necropsy of the viscera and examination of wet mounts or histopathology of internal organs. 58. Digenean trematode infection: general features. 63. Myxozoan infection: general features. 69. Miscellaneous important myxozoan infections. 73. Diplomonad fl agellate infection. 12. PROBLEMS 77 through 88: Rule-out diagnoses 1 (viral infections): Presumptive diagnosis is based on the absence of other etiologies combined with a diagnostically appropriate history, clinical signs, and/or pathology. Definitive diagnosis is based on presumptive diagnosis combined with confirmation of viral presence (e.g., antibody probe, gene probe). 77. Systemic viral diseases: general features. 78. Channel catfi sh virus disease. 79. Infectious pancreatic necrosis and other aquatic birnaviruses. 83. Spring viremia of carp. 88. Miscellaneous systemic viral diseases and infections. 13. PROBLEMS 89 through 99: Rule-out diagnoses 2: Presumptive diagnosis is based on the absence of other etiologies combined with a diagnostically appropriate history, clinical signs, and/or pathology. Definitive diagnosis is based on presumptive evidence combined with further, more extensive workup with a specific identifi cation of the problem. 97. Acute ulceration response/environmental shock/delayed mortality syndrome. 14. PROBLEMS 100 through 102: Rule-out diagnoses 3: Presumptive diagnosis is based on the absence of other etiologies combined with a diagnostically appropriate history, clinical signs, and/or pathology. Definitive diagnosis is not possible since the etiology is unknown (idiopathic). 102. Miscellaneous important idiopathic diseases. 15. PROBLEM 103: Diagnoses made by examination of eggs. PART III METHODS FOR TREATING FISH DISEASES. 16. General Concepts in Therapy. Recommended Treatments in Various Culture Systems. Appendix I Fish Disease Diagnosis Form. Appendix III Scientifi c Names of Fish Mentioned in the Text. Appendix IV Defi nitions of Terms. Appendix V Example Form for Shipping Fish to a Clinic or Diagnostic Laboratory.